The American bison (American buffalo or just buffalo) is a bovine mammal. "Buffalo" is something of a mistake (a 'misnomer') as it is only distantly related to the water buffalo and the African buffalo. Bison are a keystone species. Their staple foods are grasses and sedges. They once roamed the North American continent in great herds, and their grazing helped shape the ecology of the Great Plains. The bisons has a large head with relatively small, curving horns. Its dark brown coat is long and shaggy on the forequarters, including the front legs, neck, and shoulders, while the rest of the body has shorter, finer hair. American bison live in river valleys, and on prairies and plains. Typical habitat is open or semi-open grassland, as well as sagebrush, semi-arid lands and scrublands. 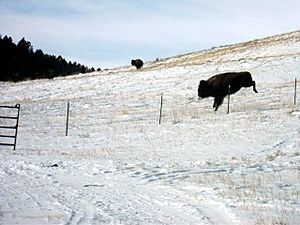 Bison will also graze in hilly or mountainous areas where the slopes are not steep. Though not particularly known as high altitude animals, bison in the Yellowstone Park are frequently found at elevations above 8,000 feet and the Henry Mountains bison herd is found on the plains around the Henry Mountains, Utah, as well as in mountain valleys of the Henry Mountains to an altitude of 10,000 feet. Although bison once roamed across North America, they are now ecologically extinct over most of their historic range. They live on in a few national parks and other small wildlife areas. Grazing in Yellowstone National Park. 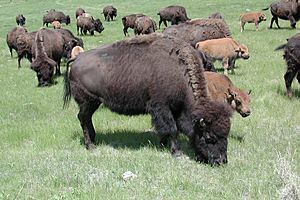 A bison has a shaggy, long, dark brown winter coat, and a lighter weight, lighter brown summer coat. Bison can reach up to 6 feet 6 inches (2 m) tall, 10 feet (3 m) long, and weigh 900 to 2,200 pounds (410 to 1,000 kg). As typical in ungulates, the male bison is slightly larger than the female. The biggest specimens on record have weighed as much as 2,500 pounds (1,100 kg). The heads and forequarters are massive, and both sexes have short, curved horns, which they use in fighting for status within the herd and for defense. Bison are herbivores, grazing on the grasses and sedges of the North American prairies. They eat in the morning and evening, and rest during the day. Bison mate in August and September; gestation is 285 days. A single reddish-brown calf, born the following spring, nurses for a year. Bison are mature at three years of age, and have a life expectancy of approximately 15 years in the wild and up to 25 years in captivity. For the first three months of life, juveniles are lighter in color than mature bison. One very rare condition is the white buffalo, in which the calf turns entirely white. White bison are considered sacred by many Native Americans. Although they are superficially similar, the American and European bison exhibit a number of physical and behavioral differences. The American species has 15 ribs, while the European bison has 14. The American bison has four lumbar vertebrae, while the European has five. Adult American bison are not as rangy in build, and have shorter legs. American bison tend to graze more, and browse less than their European cousins, due to their necks being set differently. Compared to the nose of the American bison, that of the European species is set farther forward than the forehead when the neck is in a neutral position. The body of the American bison is hairier, though its tail has less hair than that of the European bison. The horns of the European bison point forward through the plane of its face, making it more adept at fighting through the interlocking of horns in the same manner as domestic cattle, unlike the American bison which favors charging. American bison are more easily tamed than their European cousins, and breed more readily with domestic cattle. American bison grazing in Custer State Park in South Dakota. There are approximately 500,000 bison in captive commercial populations (mostly plains bison) on about 4,000 privately owned ranches. Bison are now raised for meat and hides. The majority of bison in the world are being raised for human consumption. Bison meat is lower in fat and cholesterol than beef, a fact which has led to the development of beefalo, a fertile cross-breed of bison and domestic cattle. Bison are found in both publicly and privately held herds. Custer State Park in South Dakota is home to 1,500 bison, one of the largest publicly held herds in the world. Wildlife officials believe that free roaming and genetically pure herds on public lands in North America can be found only in Yellowstone National Park, Henry Mountains in Utah, Wind Cave National Park in South Dakota, and in Elk Island National Park and Wood Buffalo National Park in Alberta, Canada. Recent genetic studies of privately owned herds of bison show that many of them include animals with genes from domestic cattle. For example, the herd on Santa Catalina Island, isolated since 1924 after being brought there for a movie shoot, were found to be mostly crossbreeds. It is estimated that there are as few as 12,000 to 15,000 pure bison in the world. The numbers are uncertain because the tests used to date – mitochondrial DNA analysis – indicate only if the maternal line (back from mother to mother... ) ever included bovines and thus say nothing about male input in the process. 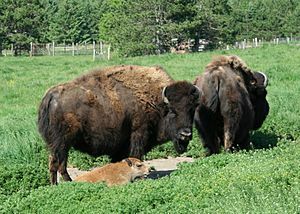 It was found that most hybrids look exactly like purebred bison - therefore, looks were not a good indicator of genetics. Bison are mostly grazers, with both male and female herds migrating in parallel with the seasons and annual grasses. Bison can eat most of the grass in an area in a short time and thus have to keep migrating to feed more of the entire herd. Female bison live in maternal herds which include other females and their offspring. Male offspring leave their maternal herd when around three years old and will either live alone or join other males in bachelor herds. Male and female herds do not mingle until the breeding season. Bison are polygamous. During the breeding season, dominant bulls maintain a small harem of females for mating. Individual bulls "tend" cows until allowed to mate, by following them around and chasing away rival males. The tending bull will shield the female's vision with his body so she will not see any other challenging males. A challenging bull may bellow or roar to get a female's attention and the tending bull has to bellow/roar back. The most dominant bulls mate in the first 2–3 weeks of the season. More subordinate bulls will mate with any remaining estrous cow that has not mated yet. Male bison play no part in raising the young. Bison herds have dominance hierarchies that exist for both males and females. A bison's dominance is related to its birth date. Bison that are born earlier in the breeding season are more likely to be larger and more dominant as adults. Thus bison are able to pass on their dominance to their offspring as dominant bison breed earlier in the season. In addition to dominance, the older bison of a generation also have a higher fertility rate than the younger ones. Homosexual behavior – including courtship and mounting between bulls – is known to occur among bison. The Mandan nation Okipa festival concludes with a ceremonial enactment of this behavior, to "ensure the return of the buffalo in the coming season." Inter-sexual bison also occur. The Lakota refer to them as pte winkte – pte meaning bison and winkte designating two-spirit – thereby drawing an explicit parallel between transgenderism in animals and people. 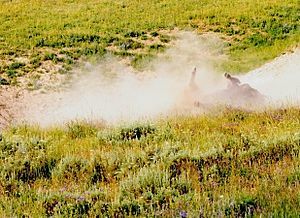 A bison is taking a dust bath in a wallow in Yellowstone National Park. A bison wallow is a shallow depression in the soil, which is used either wet or dry. Bison roll in these depressions, covering themselves with dust or mud. 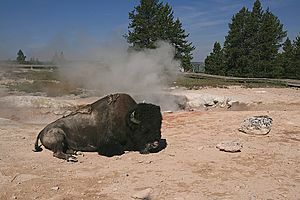 Past explanations and current hypotheses suggested for wallowing behavior include grooming behavior associated with shedding, male-male interaction (typically rutting behavior), social behavior for group cohesion, play behavior, relief from skin irritation due to biting insects; reduction of ectoparasite (tick and lice) load; and thermoregulation. 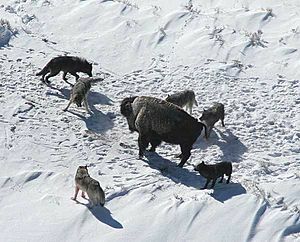 In some areas, wolves are a major predator of bison. Wolf predation typically peaks in late spring and early summer, with attacks usually being concentrated on cows and calves. Observations have shown that wolves actively target herds with calves over ones with none. Bison display five apparent defense strategies in protecting calves from wolves. These include running to a cow, running to a herd, running to the nearest bull, run in the front or center of a stampeding herd, and entering water bodies such as lakes or rivers. When fleeing wolves in open areas, cows with young calves take the lead, while bulls take to the rear of the herds, to guard the cows' escape. The length of a bison hunt varies, ranging from lasting a few minutes to 11 hours. Bison typically ignore wolves not displaying hunting behavior. Packs specializing in bison tend to have a greater number of males, as their superior size to the females allows them to wrestle bison to the ground more effectively. The Grizzly Bear can also pose a threat to calves and sometimes adult bison. 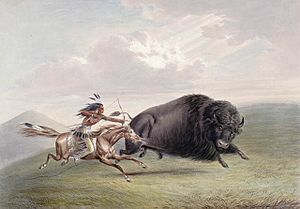 A bison hunt depicted by George Catlin. American Bison were hunted for centuries by the Plains Indians, initially through driving the bison on foot into corrals or over cliffs. After the arrival of Europeans, the Plains Indians were able to hunt the bison by horse. As European-descended populations began to press west from the eastern portions of the United States in the 19th century, the bison population was hunted heavily. 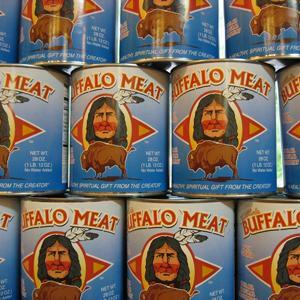 Americans hunted the buffalo for skins, leaving the meat to rot, in some cases allegedly with the specific intent of depriving the Plains Indians of a food source. Per historian Pekka Hämäläinen, Native Americans also contributed to the collapse of the bison, with the Comanche alone killing 280,000 bison a year by the 1830s, near the limits of sustainability. A long and intense drought further increased the pressure on the bison population. At the end of the 19th century, conservationists – alarmed by the decline of the buffalo – began to take measures to preserve the population, despite lack of support from the United States government. Conservationists such as James "Scotty" Philip acquired buffalo and bred them on private land in hopes of reintroducing the species. Canada, the United States and Mexico list bison nationally as both wildlife and domestic livestock. Legal status varies among State and Provincial jurisdictions. In Canada, four provinces and two territories list bison as both wildlife and livestock. 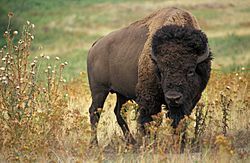 Bison are listed by 20 states in the United States; 10 states list bison as wildlife and all 20 list them as livestock. In the modern day, bison hunting is allowed in limited areas to cull herds to target population, and to prevent wild bison from mingling with (and thus sharing diseases with) domestic herds. Bison are legally hunted in the American states of Wyoming and Montana, and the Canadian province of Alberta. The first thoroughfares of North America, except for the time-obliterated paths of mastodon or muskox and the routes of the Mound Builders, were the traces made by bison and deer in seasonal migration and between feeding grounds and salt licks. Many of these routes, hammered by countless hoofs instinctively following watersheds and the crests of ridges in avoidance of lower places' summer muck and winter snowdrifts, were followed by the Indians as courses to hunting grounds and as warriors' paths. They were invaluable to explorers and were adopted by pioneers. Bison traces were characteristically north and south, but several key east-west trails were used later as railways. Some of these include the Cumberland Gap, from the Potomac River through the Allegheny divide to the Ohio River headwaters, and through the Blue Ridge Mountains to upper Kentucky. A heavily used trace crossed the Ohio River at the Falls of the Ohio and ran west, crossing the Wabash River near Vincennes, Indiana. In Senator Thomas Hart Benton's phrase saluting these sagacious path-makers, the bison paved the way for the railroads to the Pacific. The 1935 buffalo nickel – this style of coin featuring an American bison was produced from 1913 to 1938. American Bison on the obverse of the 1901 $10 bill. The American bison is often used in North America in official seals, flags, and logos. In the United States, the American Bison is a popular symbol in the Great Plains states. 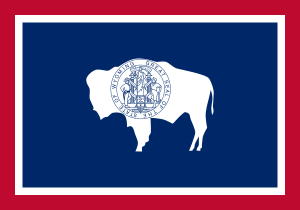 Kansas, Oklahoma, and Wyoming have adopted the animal as their official state mammal, and many sports teams have chosen the bison as their mascot. In Canada, the bison is the official animal of the province of Manitoba and appears on the Manitoba flag. It is also used in the official coat of arms of the Royal Canadian Mounted Police. Several American coins feature the bison, perhaps most famously on the reverse side of the "buffalo nickel" from 1913 to 1938. In 2005, the United States Mint coined a nickel with a new depiction of the bison as part of its "Westward Journey" series. The Kansas and North Dakota state quarters, part of the "50 State Quarter" series, each feature bison. The Kansas state quarter has only the bison and does not feature any writing, while the North Dakota state quarter has two bison. Bison can leap a standard 36 inch barbed-wire fence with ease, as seen here near Lake George, Colorado. Bison are among the most dangerous animals encountered by visitors to the various U.S. and Canadian National Parks, especially Yellowstone National Park. Although they are not carnivorous, they will attack humans if provoked. They appear slow because of their lethargic movements, but they can easily outrun humans—they have been observed running as fast as 35 miles per hour (56 km/h). Between 1978 and 1992, nearly five times as many people in Yellowstone National Park were killed or injured by bison as by bears (12 by bears, 56 by bison). Bison are also more agile than one might expect, given the animal's size and body structure. American bison Facts for Kids. Kiddle Encyclopedia.